Green-crowned woodnymph (Thalurania colombica fannyi). The Government of Colombia is poised to sign a Peace Agreement with the FARC (Revolutionary Armed Forces of Colombia—People's Army), ending 50 years of armed conflict. As the country begins to pursue new ways to support economic development for local people in former conflict areas, opportunities based on sustainable use of natural resources should not be overlooked. One such opportunity is bird tourism. 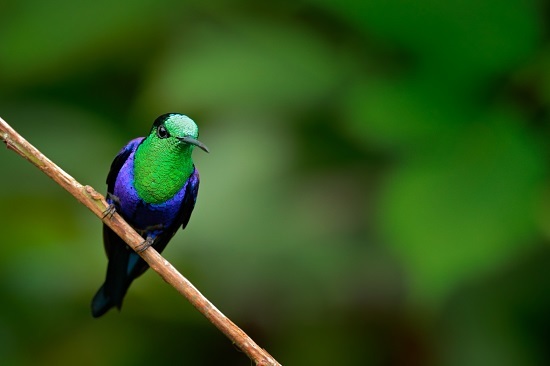 Colombia has the greatest bird diversity in the world. More than 1,900 species have been registered, equivalent to 20% of all bird species on the planet. Until now, armed conflict has kept much of the country off limits to visitors, even to adventurous birders. As a result, a valuable market has been kept at bay. In collaboration with the National Audubon Society, CSF is finalizing an economic valuation study aimed at understanding the potential scope of bird tourism to Colombia once the Peace Agreement is signed. We used the contingent valuation method to understand potential visitors’ interest in an illustrative tour that combines participation of local communities and visits to important and newly accessible areas for birding. Data were gathered through a unique partnership with Audubon, which permitted us send an online survey to all its members for the purposes of this study. On September 2, CSF will present the results of the study in Bogota. The event will include representatives from the media, as well as private and public organizations working in conservation, tourism, and development in Colombia including Audubon, Patrimonio Natural, USAID, and Semana Sostenible .